Like someone else, creepy face, scary opinions. “”It won't be over without mass violence, bloodshed, and death on a scale we haven't seen since the Middle Ages. 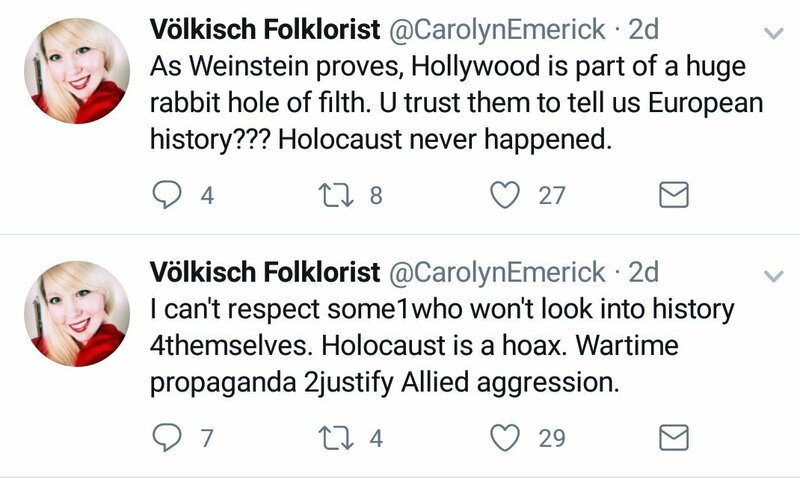 Carolyn Emerick (online alias: Völkisch Folklorist) is a neo-Nazi, Holocaust denier conspiracy theorist nutjob and alt-righter/white nationalist pseudo-folklorist who publishes Europa Sun which she describes as "promoting European-heritage" and an "unabashedly pro-West cultural magazine". 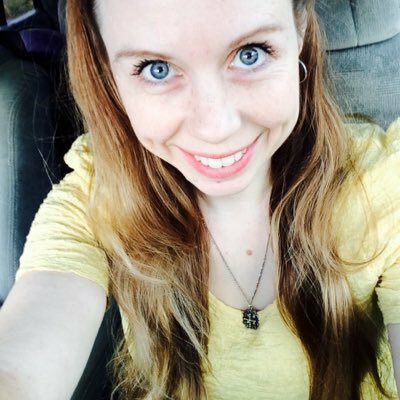 Emerick argues America should be a Hitlerian ethnostate for white people and supports this through sterilisation and non-voluntary repatriation of non-whites; she disturbingly ran a Twitter poll about how to bring about the ethnostate, with many of her neo-Nazi followers choosing violent options. In April 2018, Emerick was permanently suspended from Twitter, presumably for hate speech. 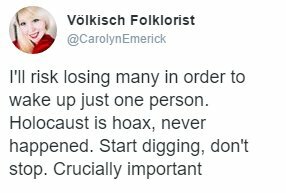 Tweets from 2017 reveal Emerick is a Holocaust denier. “”Holocaust is a hoax, never happened. Start digging, don't stop. So, one thing ppl use against me is Holobollocks denial. Here's the shocker. I attribute the hoax to Allied govs more than "Jewish conspiracy." They had to justify the massive loss of life to the public. On the heels of WWI massive losses. I believe it's Gov propaganda. So eat it. 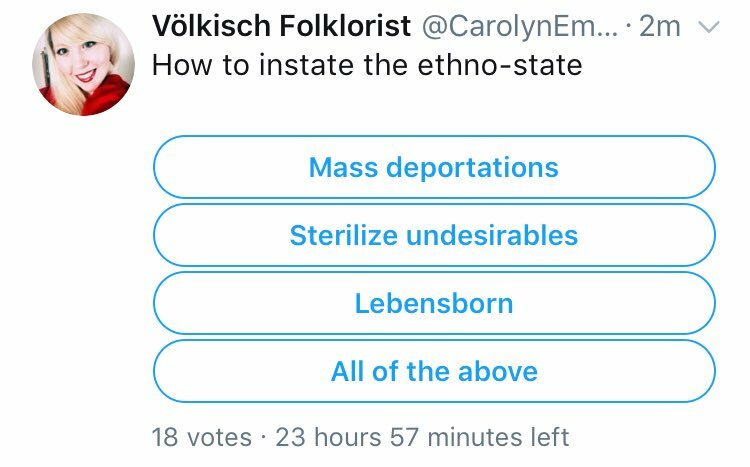 Carolyn Emerick, a white supremacist author, who last month posted a deeply bizarre Twitter poll asking users "How to instate the ethno-state," which included explicitly Hitlerian options like “Sterilize undesirables, suggested to Newsweek in a Facebook chat that female white nationalists were being targeted unfairly by reporters. “Why nobody is [sic] questioning the motives of the Japanese in maintaining their ethnostate?” she asked. Emerick doesn't seems to know that Japan is not the best example of an ethnostate, chiefly for two reasons: first, Japanese liberals are evolving Japan's restrictive immigration and acculturation policies, albeit quietly. For one, in 2016 prime minister Shinzo Abe vowed to provide foreign workers with "the world’s fastest path to permanent residency in Japan". Second, claims to Japanese 'ethnic homogenity' are actually quite non-sensical: Japan has already accepted about 2,32 million immigrants, representing roughly 2% of Japanese citizens. And immigration aside — just consider the 'heterogenity' already inherent to Japan. Perhaps most crucial of all; Japan isn't exactly a brilliant example to hold up in support of any thesis that "keeping immigrants out saves nations ". In fact, as a consequence of its historically über-strict immigration policies, an unprecedented demographic crisis (read: acute lack of youths with elbow grease) now looms over Japan, leaving a massively increased influx of immigrants their best (and maybe only) option for safeguarding the very future of their country. According to Emerick, all non-whites "have to go back… MASS DEPORTATIONS". She has appeared as a guest on "This Week on the Alt Right" with Tara McCarthy and Bre Faucheux. Emerick is open about herself being pro-Hitler/neo-Nazi; on Gab she has posted Nazi-swastikas and an image of Adolf Hitler with a love emoticon. She has described the Nazis as "good guys". “”Britain and Germany are very close ethno-cultural brothers. One of the two nations' world leaders knew this and wanted peace. It wasn't Churchill. Look it up. Dig deeper... you can't understand what's going on now if you keep believing the false narrative we're spoon fed. She wants to ban Islam and deport all Muslims from her country. “”I may be judged for my strong stance on inter-familial miscegenation but I have an exceptionally pure bloodline & I will not abide by it being flushed down the shitter after 400 years of racial purity in the New World. We are VERIFIED Mayflower descendants! No, I cannot accept it. “”I do not endorse Euro-mixing. Closely related neighbouring people it's less of a crime, Italians and Greeks go for it, Celt-German IMO is not a big deal (more Celts have Germanic blood than they know). But Northern Europeans with Northern, Southern w Southern. However, her views on the latter appear quite contradictory. On her Twitter and her website she promotes a pan-European identity with the banner "I love Europe" and so seems to encourage mixing between any ethnic group as long as they are considered "White European"; she has also posted her own multicultural food dishes from across Europe mixing Polish, German, Swiss etc foods. ...a brief look inside shows the use of the insignia of the 7th SS Volunteer Mountain Division Prinz Eugen, a German mountain infantry division of the Waffen-SS, the armed wing of the German Nazi Party. Folklorists have criticized Emerick as a pseudo-folklorist and crank who has quote-mined and distorted sources to support her own far-right political agenda; among the scholars Emerick has misquoted or taken out of context is Jeana Jorgensen. She has an account on Academia.edu. However, none of the articles Emerick has uploaded are peer-reviewed, but are published in the magazine The Celtic Guide, a non-academic and arguably a pseudohistorical publication. This explains why her articles are filled with historical inaccuracies and are in general, poorly written. She promotes the white genocide conspiracy theory. Similar to Tara McCarthy and Wife with a Purpose she argues for white people to have more children. ↑ Völkisch Folklorist: "Writes about the history, myth, and folk belief of Northern Europe. Editor of the first unabashedly pro-West cultural magazine, #EuropaSun". ↑ How to instate the ethno-state (archive.is). ↑ Screenshot 1, 2, 3. 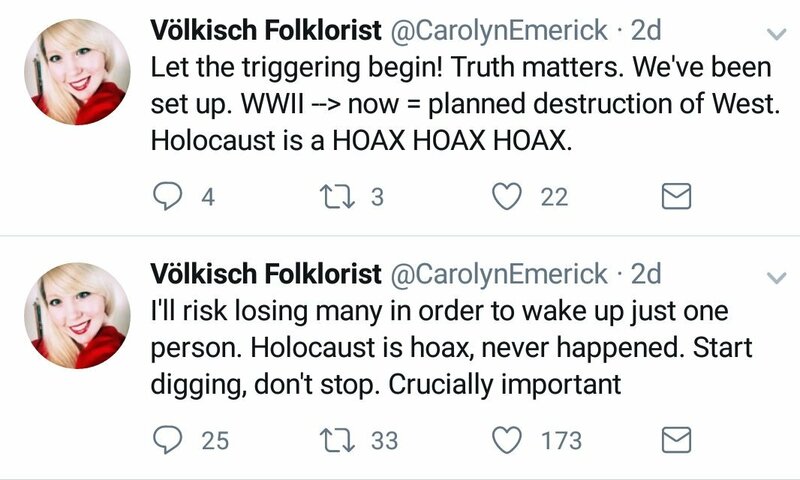 ↑ Please report Holocaust denial, racist account CarolynEmerick. ↑ Alt-Right Women Asked to 'Choose Submission' to Grow Political Movement. Newsweek. 16/11/17. ↑ Völkisch Folklorist‏@CarolynEmerick. Twitter. 27 Dec 2017 (archive.is). ↑ Völkisch Folklorist‏@CarolynEmerick. Twitter. 27 Dec 2017. ↑ Europa Sun (preview) at Amazon. ↑ Amazon Review (Oct. 2017): "Propaganda with very dark overtones, and explicit Nazi imagery. Avoid!" ↑ Dear White Supremacists: Why Would You Cite Me?!. Patheos. 14/08/17. ↑ Pagan Community Notes: ADF; Kenny Klein; Witchcraft Museum, and more. The Wild Hunt. 15/05/17 (archive.is). ↑ The Celtic Guide. Emerick's most recent contributions to this magazine was September 2014. ↑ The West's Greatest Sin is Betraying Ourselves (archive.is). ↑ Example 1, 2, 3, 4. This page was last modified on 20 December 2018, at 16:37.